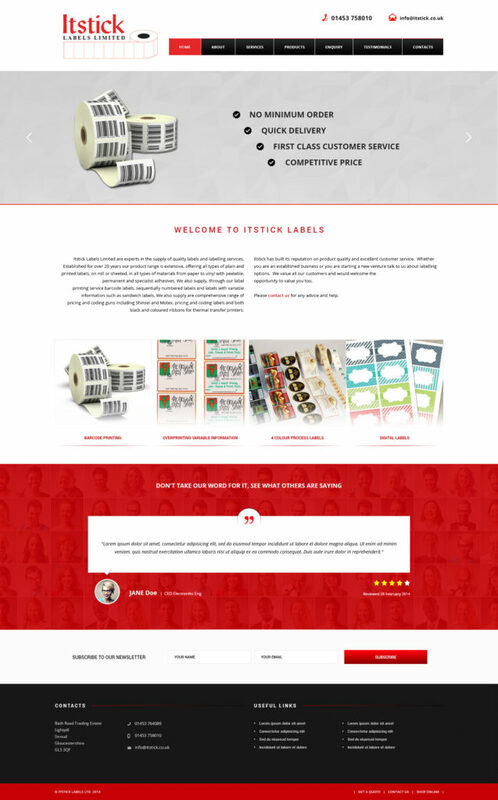 Itstick Labels was founded in February 1986 and at this time they supplied hand held labellers and labels to shops and industry. Since then they have expanded and developed a wide range of products and now supply all types of self adhesive labels, plain and printed, label guns and labels plus thermal transfer ribbons. The team at Itstick labels approached us in 2014 looking to start a digital marketing campaign and increase their rankings and traffic. Their campaign has had a dual on and off site focus which has included managing the different social media accounts. This has been an interesting company to be involved in and we have been pleased with the progress. Itstick have recently experienced their best 6 month period to date and their site rankings are excellent. The current (October 2017) ranking positions return their site at #1 for the keywords ‘Label Printers Stroud’ and ‘Label Printers Gloucestershire’. This is a fantastic achievement and we look forward to seeing continued success for Itstick. From our first meeting with Peter to the completion of our lovely new website we have been impressed with the professionalism of everyone at Mushroom Internet. Ben has been brilliant, endlessly patient and quick to understand our particular requirements and to action any changes we requested. Emma has explained the benefits of SEO and has been so enthusiastic about our Company and it’s potential. We are looking forward to continuing to work with Mushroom Internet, a perfect choice for any company looking for excellent website development and support.